Formulated with a 4:1 Ratio of Omega 6 to Omega 3 in liquid form. Purchase this product now and earn 19,880 Reward Points! Of the tens of thousands of molecules that make up the life of a cell, Phosphatidylcholine (PC) stands apart; probably the most important one of all. BodyBio PC is made of only pure phospholipids which automatically form liposomes in the watery environment of the body, but it goes one important step further… it is also formulated with the essential lipids at a 4:1 ratio. Most PC currently available has an EFA ratio of ~12:1. BodyBio PC not only has a higher concentration of phospholipids, up to 66%, but also maintains EFA concentration at the preferred 4:1 ratio, a BodyBio exclusive. * Daily Values are based on a 2000 calorie diet. INGREDIENTS: Phosphatidyl-Choline, Phosphatidyl-Ethanolamine, Phosphatidyl-Inositol, minor glycolipids. A proprietary blend of essential fatty acids linoleic and alpha linolenic, oleic acid, minor fatty acids and ethanol. 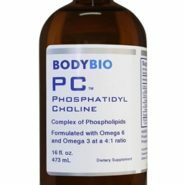 BodyBio PC is a special, highly concentrated mixture of phospholipids with thehighest one being Phosphatidylcholine. The key fact is that PC declines withage and disease. One tsp of BodyBio PC contains between 1500–1800 mg of PC. Two capsules contains 450–605 mg of PC. Another crucial component of a phospholipid is the type of fatty acids attached to it. A phospholipid such as soy-derived polyenylphosphatidylcholine is rich in linoleic and linolenic acids, polyunsaturated fatty acids that provide “fluidity” to the cell membrane. Maintaining membrane fluidity is vital, as the membrane is crucial to the majority of cellular activities. 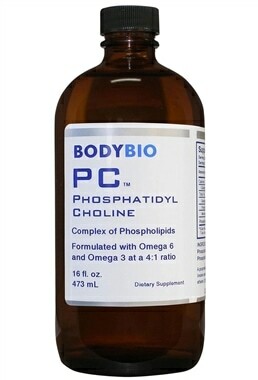 BodyBio PC is formulated with those important essential oils, the omega 6 and the omega 3’s at a 4:1 ratio. 4 parts of omega 6 from soybean oil and 1 part of omega 3 from flax oil. BodyBio PC requires additional processing of the Lecithin material to arrive at a high concentration of phospholipids, providing a quality PC.